This spacious, well furnished and equipped dormer bungalow, adjacent to the owners home is situated in the quiet coastal village of Ulrome, only 0.5 mile walk to the lovely beach, it makes the ideal seaside holiday home. 5 miles north of Hornsea, famous for its pottery, mere and Freeport Shopping Centre. Situated 8 miles south of the seaside resort of Bridlington with its seafront rides, habour and cliff top walks. An excellent touring base for the other bustling seaside resorts of Filey, Scarborough, Whitby, Staithes and Robin Hood Bay all well worth a visit. Inland to the market towns of Driffield, Beverley and the superb historic city of York all within easy reach. Ground floor: Living room with French doors. Dining room. Kitchen with wooden floor. Conservatory with French doors. 1 double bedroom. Bathroom with bath, shower cubicle and toilet. First floor: 2 bedrooms: 1 double (5ft) with additional single, 1 twin. Gas central heating, gas, electric, bed linen and towels included. Cot. High-chair. Freeview TV. DVD and small library. CD. Gas hob. Microwave. Washing machine. Shared lawned garden with patio. Parking (3 cars). No smoking please. Holidays run from Friday to Friday. NB: Large raised pond in the garden. For a better idea of where Avonlea is, you can see Avonlea on the map below. Avonlea is in North Humberside; should you be on the lookout for a special offer, you can find all the special offers in North Humberside. It's always worth checking to see what is on offer at the moment. 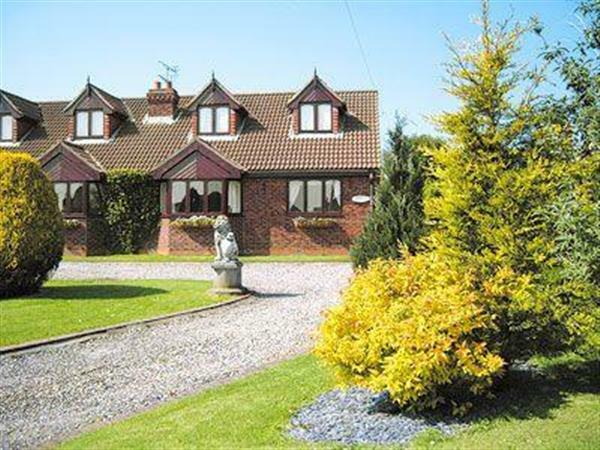 Do you want to holiday near Avonlea (W41126), you can see other cottages within 25 miles of Avonlea; have a look to find your perfect holiday location.